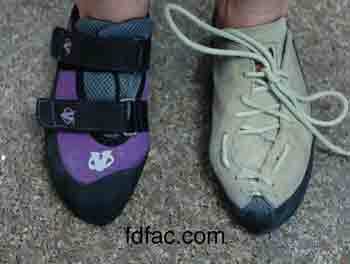 OD came in today with her climbing shoes. If you’re a rock climber then you already know how painfully short and tight these shoes are. Discussing the rationale behind this or the lack of a single scientific studies supporting this will be tabled to another blog posting on another day. For now, I am going to return to the basics and remind you that a square peg is not designed to go into a round hole, especially if you have a bunion (wide forefoot) which OD has. She has been wearing the Mad Rock shoes on the right for the past few years. 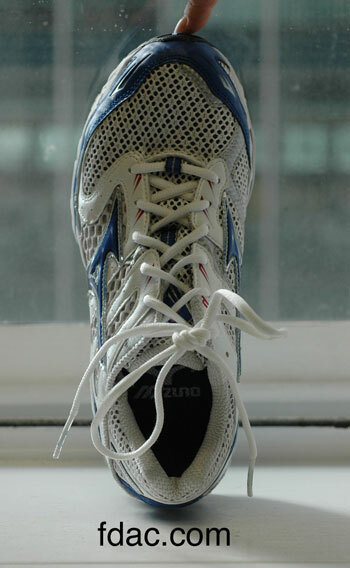 Because they are starting to wear out, she purchased a new pair of Evolv shoes shown below on the left. 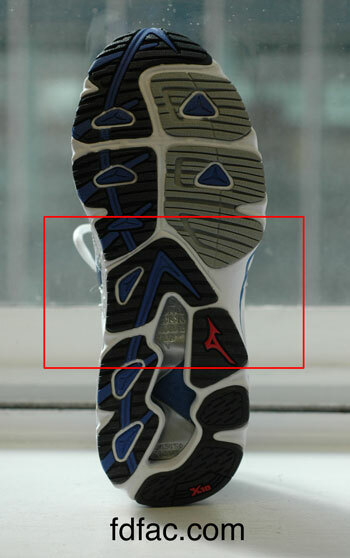 As you can see from the above image, these two shoes are not designed the same. The Evolv on the left is much narrower than the Mad Rock on the right, and the widest part of the shoe (forefoot) is not adjustable because it has straps instead of laces that don’t go as far down to the toes. 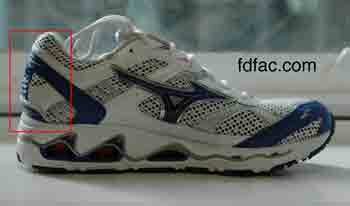 If you have a wide forefoot then you want the shoe to be adjustable at the widest point. Although laces are less popular than straps, this is a must-have design for a wide foot. If you’re comparing two laced styles, check the width by turning the shoe over and comparing the width of the forefoot between the pairs. 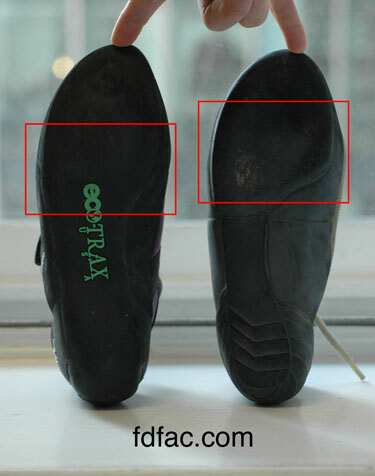 Again, in comparing the images below, with the Evolv on the left to the Mad Rock on the right, it’s easy to see independent of the upper, that the Mad Rock has a wider forefoot sole. 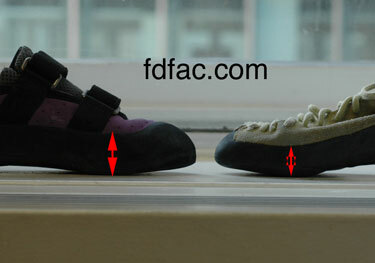 Finally, if you need even more forefoot room, you can always modify the lacing on your climbing shoes. 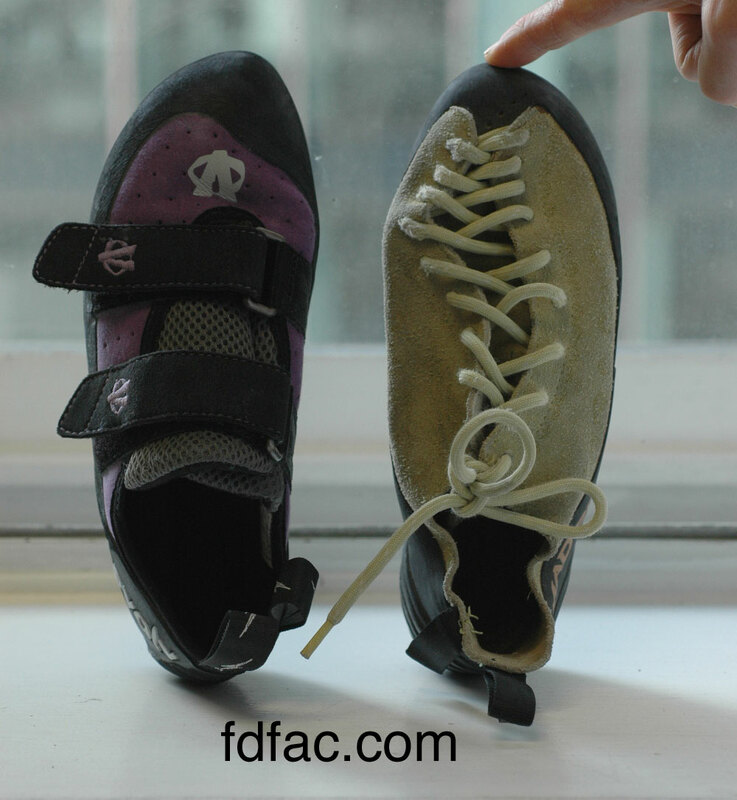 This image shows what we did with OD’s shoes. Both feet are the same width, but the Evolv shoe on the left is essentially acting like a vice grip. You will not experience a loss of gripping ability with the modified lacing on the left, but an enormous improvement in overall comfort and fit.